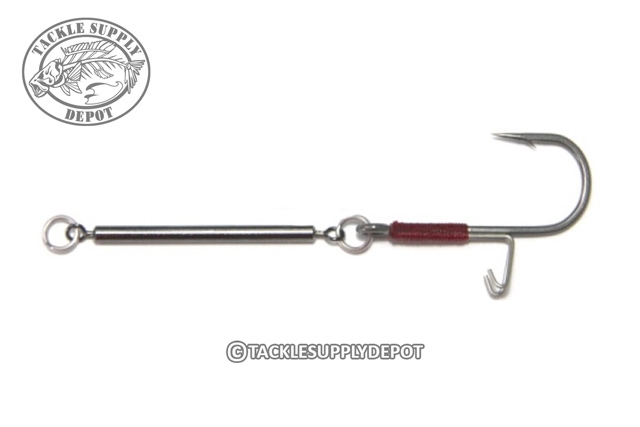 The Zappu Hitch Trailer Hook will aid in turning those short strikers into landed fish. The single hook is constructed with a long solid barrel swivel by premium stainless steel split rings allowing anglers to quickly attach the hook to a variety of baits and lures on the market. A piece of surgical tubing around the end of the construction prevents it from sliding past the barb and resulting in coming off the main hook. A double pronged keeper on the backside of the trailer hook holds tight to soft plastics thereby keeping the Hitch Trailer Hook always pointing upward and ready for that next fish.